Stay seaside during your North Myrtle Beach vacation and enjoy ocean views, an indoor swimming pool and convenient access to all the popular North Myrtle Beach amusements and attractions. This North Myrtle Beach resort is between 23rd and 24th Avenues South. It is a charming North Myrtle Beach resort on the oceanfront. Seaside Resort is 20 stories tall. The bottom five floors are the parking garage and the top 15 stories are accommodating North Myrtle Beach rentals. When you come to the beach you will want to go home with a suntan. Lounge by the oceanfront swimming pool and bask in the sunshine to get that bronzed glow that reminds everyone you have been at the beach. Seaside Resort has a pool deck on which you can lounge in a chair, swim in the sparkling blue pool and soak in the hot tub. 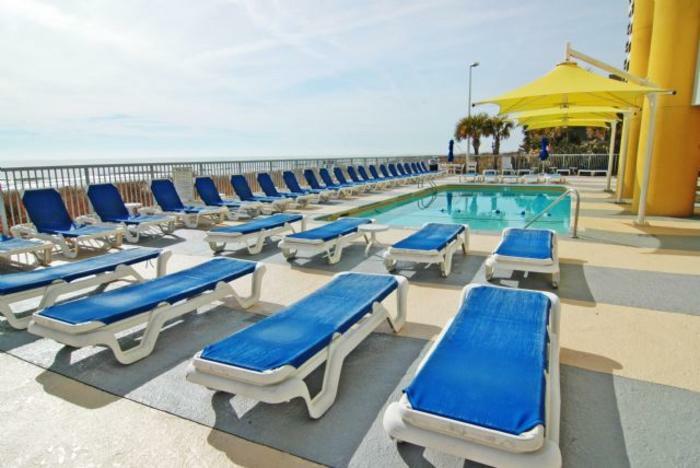 Some of the North Myrtle Beach rentals at Seaside Resort overlook the pool deck so your family can sit on your private balcony and watch the poolside fun below. The Seaside Resort has more than an oceanfront swimming pool and a relaxing hot tub for you to enjoy during your North Myrtle Beach vacation. There are also water amenities inside this North Myrtle Beach resort. An indoor swimming pool is on the ground level of Seaside Resort. There is also an indoor lazy river at this North Myrtle Beach resort. Indoor water amenities at Seaside Resort even include a hot tub. When you spend your North Myrtle Beach vacation at Seaside Resort you can take advantage of the on-site fitness room. Go for a run on the beach, lift weights and burn some calories. You might appreciate the opportunity for such levels of fitness if you indulge in the succulent seafood for which this seaside town is known. The condominiums at this North Myrtle Beach resort are luxurious. So not only will you enjoy accommodations at an oceanfront resort in North Myrtle Beach, SC but you will also be enveloped in plush comfort in a spacious two- or three-bedroom North Myrtle Beach rental. The two-bedroom North Myrtle Beach vacation rentals at Seaside Resort have two baths and sleep six or eight people. The three-bedroom North Myrtle Beach condominiums at Seaside Resort are larger and have more baths. You will find three baths in these condos in North Myrtle Beach, SC and they are furnished so as to sleep 10 people. Elliott Beach Rentals is not affiliated with onsite management or the HOA of Seaside Resort.